No other tire dealer offers a larger product selection to meet all your OTR needs. We have a complete line-up (Michelin, Yokohama, Bridgestone, Nokian Tyres, Firestone, BKT, Maxam, Westlake). This means we can be very specific about what tread design is best suited for your application and budget. 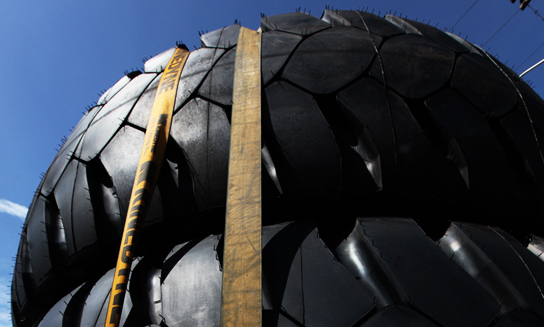 We also offer a complete line of OTR retread solutions and repair services. Kal Tire has the equipment and the high level of competency in our people to handle the smallest OTR tires (loaders/graders, etc.) to the largest (like the tires we supply to the open pit mines). Many of our locations are equipped with a full Hiab service crane truck capable of handling up to 2700/49. We also have the ability to performance track your tires. This means you can see for yourself what tire is providing the lowest operating cost per hour or per ton.